“Everybody’s shocked,” said managing editor Nyan Win. “We’ve been trying so hard for the past two months – we were trying up until this morning. It’s a complicated story of investment matters, but basically we’re looking for a new investor,” he told DVB on Monday. Myanma Freedom Daily was funded by family and friends; posing a stark contrast to the majority of other newspapers in Burma, which have the financial backing of local tycoons. 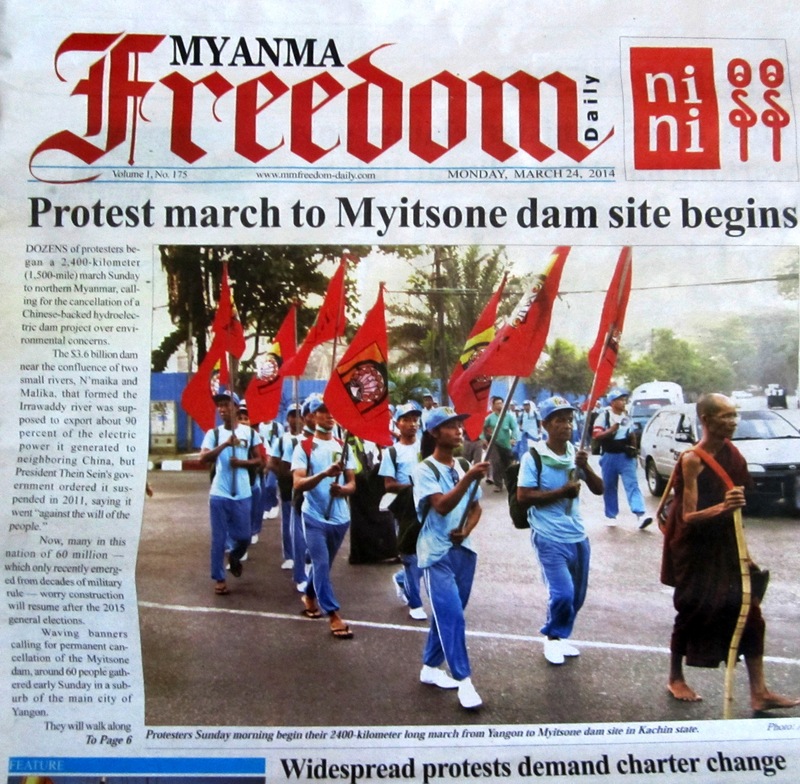 Myanma Freedom Daily had a circulation of 10,000 copies a day and in a 31 March editorial it was stated that the electronic version of the newspaper had just exceeded 100,000 clicks. “We’ve received a lot of messages of support from our readers,” he said. However Thiha Saw cautioned that Burma’s media landscape is changing so quickly that by the time his newspaper re-emerges, competition may be even fiercer. Thiha Saw, who is also a member of the Interim Press Council and vice-president of the Myanmar Journalists Association, voiced criticism of the draft Public Service Media Law, which would see state-run media, such as The New Light of Myanmar, transformed into a government-funded, yet independently monitored media service. The Interim Press Council has opposed the bill since it was first submitted to parliament last year. Several prominent members of the media have criticised the bill – whose details remain vague – for potentially allowing state-run media to outrun its private rivals on the basis of having access to funds from the state budget and a lack of transparency in regulation. “The government isn’t attempting to confer any benefits on privately run media, such as giving us a two-year tax free period,” said Thiha Saw. The suspension of Myanma Freedom Daily serves as a reminder that times are uncertain for journalists in Burma. The newspaper’s 40-odd staff were reportedly stunned by the announcement on Monday morning. Its offices and equipment were almost deserted by noon. NB: I worked two shifts a week as a sub-editor on Myanma Freedom Daily’s news desk from October 2013 until its suspension.